Chose from many shapes, and chose concrete, steel, polymer or fiberglass walls -- and we'll build it right for you! 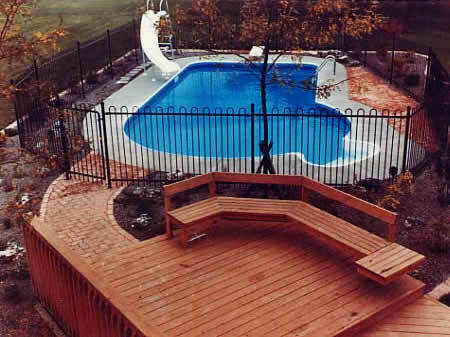 We'll help you in every way to match the pool to your yard and unique needs. The J.C. Pool affords you a whole new lifestyle with hours of fun-filled entertainment for the whole family just steps from your door, day or night. Health & Exercise -- Today the emphasis is on health and exercise. A J.C. Pool offers you the opportunity to develop a fitness program for the whole family. Select your Shape and Size -- J.C. Pools' choice of many shapes and sizes allows you to create a luxurious and inviting setting for many great get togethers. Planning and Design -- With our help, you and your family will be able to design a backyard that will both beautify and increase the value of your property. Ask about our NEW energy efficient plumbing and filtration system to reduce operating costs. New shapes include Roman End stairs and Bowed End pools in our concrete wall, inground models. Consider the energy-saving ClearDeck® In-Ground Solar Blanket Roller system with your new in-ground pool.